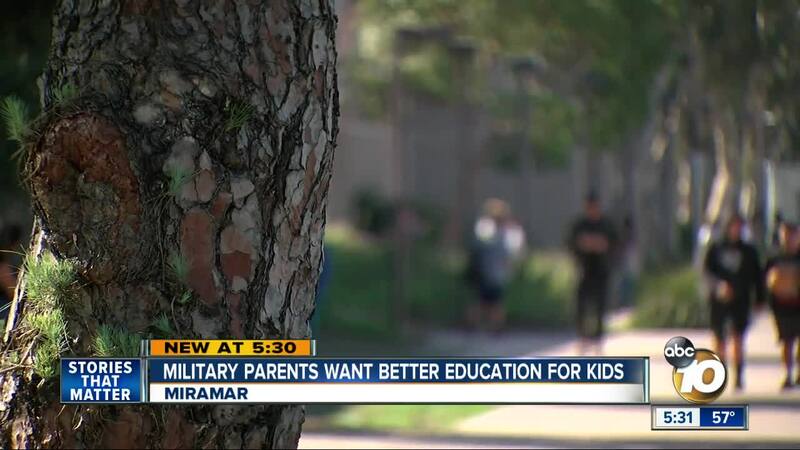 Military families face student transfer issues, 10 News spoke with SDUSD on the issue. SAN DIEGO (KGTV) - Military families sent 10News letters discussing a myriad of issues their students faced when they transferred from out of state into San Diego Unified School District. One student, who didn't want to be identified, sent a letter that read in part, "I would dread getting up everyday knowing that this was going to be a continuous process," explaining he didn't get the same treatment in an assistance program here, compared to where he previously lived. Another letter discusses a woman's special needs children, "It took over a week to even get my children placed in classrooms to start school with no updates as to why. After calling several times we were able to get placements for our children. I know that special needs children have to be placed in certain classrooms and things like that, but for it to take that long is a little excessive." She continued stating in the letter, "two of our children are waitlisted (with no foreseeable date of service) for speech therapy with a letter stating that it is because there is a "lack of available therapists" in the area." Erika Bradley said her daughter had trouble transferring AP and Honors credits, and once she was pulled out to be home schooled, she was told her daughter couldn't participate on the Varsity Soccer team. "It put her in a tailspin... We had many instances of panic attacks," she said. "We have upwards of 8,000 military dependent students within our district," Jennifer Coronel, Program Manager of Children and Youth in Transition at SDUSD said. That's about 7% of the district's student population. On SDUSD's website, you can find numerous resources for military families. The district gets anywhere from $8,000,000 to $10,000,100 in military student funding per year. "We have four Intervention Counselors that work out of the Department of Children and Youth in Transition and all of them have a specific area within San Diego Unified and assist with all matters related to military students," Coronel said. She says rules and maybe even federal laws need to change to make a smoother transition for military students. Bradley says many military families pull their students for homeschooling to get around transfer issues, but Bradley says she wants more oversight to ensure military families are taken care of in the future.